I know people in Wheeling that look on the southern part of the state with a little disdain and call them "bible thumpers." But I have met even more narrow minded people in southern WV who call anyone north of Weston "yankees" and "northerners." I know people in southern WV who never go north of Summersville for anything, and who have never been to Pennsylvania, our neighboring state. I know a lady from the Elm Grove neighborhood of Wheeling that says "yall" and I heard it from a Morgantown native as well. So can you use dialect as a classifier? Because there are Appalachian hillbillies living in Guernsey County, Ohio or Indiana County, PA who speak with a northern accent, but have Appalachian habits and customs. Being Catholic is no big deal in Parkersburg, Fairmont, or Wellsburg, but in Wyoming or Summers County people may regard a Catholic as belonging to an illegitimate cult, or at least an object of exotic curiosity. As for me, I get along well all over the state, whether eating pasta with white clam sauce in Wheeling or or going to a ramp supper in Richwood. But there is definitely a cultural fault line somewhere in the state, perhaps along the Harrison-Lewis / Barbour-Upshur county line. Though that is debatable. Last edited by italianbluesboy; 04-07-2008 at 07:41 AM..
Just asked my coworker, who is from the cultural fault line in Clarksburg, is he southern or northern and he said both and neither. But he did feel that people in southern WV are "bible thumpers". The largest denomination in WV is Methodist (Not Baptist). The only reason I made the statement is I more often hear the words "Bible-thumpers" associated with Baptist or Pentecostal churches. My family is Methodist, some Catholic,a few Baptist and Lutheran. The Morgantown/Fairmont/Clarksburg region has more of a Catholic population than the more southern areas of the state. My aunt and uncle are Baptist (live in Charleston) but their church seems more tolerant then some of the Pentecostal and Baptist churches which don't recognize other denominations (esp catholic) as Christian. I couldn't agree with you anymore italianbluesboy, the cultural fault line is located somewhere in North-Central WV, but the interesting question is where? I think this map here may be our best answer. True! 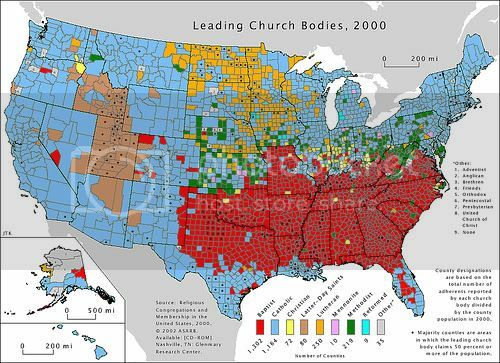 The main denomination in WV is Methodist then Baptist, followed by a small percentage of Catholic, including McDowell County for some odd reason. The catholics in the northern panhandle could be proof that these 4 counties of the state are Midwestern, but still not enough to "put a dent" in the Southern identity of West Virginia. Last edited by Colby "The Punk" Wells; 04-07-2008 at 10:57 PM..
Appalachiangirl: "So if someone lives in Wheeling,WV they are Southern,but a few miles across the panhandle to Washington,Pa they are Northern?" In May 1861 the ladies of Guyandotte, Cabell Co., WV, sewed a copy of the new Virginia state flag, and with ceremony the citizens of Guyandotte raised it above the Planter's Hotel, and as they did so shots rang out from Ohio across the river and hit the brick walls of the hotel. So you see, sometimes the differences are only the width of a river. Some of those Ohioans helped burn down Guyandotte about a year later. NCN: "My only thought on this subject came about in the break room when I introduced my friend from Virginia to my friend from West Virginia. Someone commented that they were both Virginians. The friend from West Virginia said, "Yes, but they don't claim us." Chances are that neither of your friends know anything about how Virginia became two states, and if they do know anything it is probably wrong. I like to remind Virginians that it was West Virginians (including a lot of my relatives) under Gen. John McCausland of Mason Co. who saved Lynchburg from destruction by Gen. Hunter---"The citizens of Lynchburg lionized McCausland for the conspicuous part he played in the defense of their city. At the time they expressed thanks by an address from the city council. They also gave him a golden sword with the inscription, "The City of Lynchburg to General John McCausland, July 18, 1864," and a fine saddle horse with equipment, which included a pair of solid silver spurs. These were presented to him with many expressions of gratitude. For several years, on his birthday, the city council of Lynchburg sent McCausland telegrams of appreciation. On the sixty-first anniversary of the defense of Lynchburg, June 18, 1925, Mayor Walker Pettyjohn sent McCausland this telegram: "On this sixty-first anniversary of the attack on Lynchburg, which you so ably repelled with troops under your command, permit me to remind you of the grateful remembrance of our people and express the wish that you are this day enjoying the satisfaction that must be yours through having served God and your fellowmen." Gen. McCausland was the last surviving Confederate general. One more thing everybody. On the poverty subject. Yes, like I have proved earlier, most of it (not all of it) is in the South. This is from Wikipedia. The median household income by state ranged from $34,343 or 28% below national median, in Mississippi to $66,752 or 39% above national median, in New Jersey. Connecticut, which is often referred to as the nation's wealthiest state, came in at number four with a median household income of $60,551. California which had the highest median home price in the nation, where home prices have far outpaced incomes only ranked eleventh with a median household income of $54,385. While California's median income was not near enough to afford the average California home or even a starter home, West Virginia, which had one of the nation's lowest median household incomes also had the nation's lowest median home price. The northeastern states, more specifically those located in New England, as well as the West Coast had the highest median household income. Of the top fifteen states, all were located in the Northeast and West, with the exception of Minnesota which ranked eighth and Wisconsin (15th). The southern states had, by far, the lowest median household income, with nine out of the country's fifteen poorest states being located in the South. 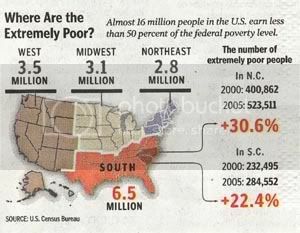 It should be noted, however, that most of the poverty in the South is located in the Black Belt region. Metropolitan areas such as Atlanta, Nashville, Raleigh-Durham, Birmingham, Dallas, Houston, Miami, to name just a few, are areas within the southern states that have above average income levels. Overall, median household income tended to be the highest in nation's most urbanized northeastern, upper midwestern and west coast states, while rural areas mostly in the southern, and mountain states had the lowest median household income. The state with the highest median household income in the United States as of the US Census Bureau 2005/06 is New Jersey with $66,752, followed by Maryland, Hawaii and Connecticut, making the Northeastern United States the wealthiest area by income in the entire country. In terms of region the median household income was as follows: "Northeast ($47,994), West ($47,680) and South ($40,773)." Median household income in the Mid-West declined by 2.8% to $44,657. Do you really think that the people in West Virginia are so much more poor than the people in New Jersey? I can't think of any place that I would want to live in New Jersey, while the one trip we took through West Virginia, I saw a lot of places I would like to live. Proverty happens when the cost of living gets too high to manage. People are fleeing New Jersey. I have traveled through many states and do not think a high per capita income indicates a lack of poverty. Places with higher incomes just have higher costs of living. I think most people in the South have a higher quality of life than those in places where money seems to be the ruling force. It's a question of values. I see what you are saying, a lack of money doesn't always represent poverty, but yes, to answer your question, most people in my state are poorer than the people of NJ. A lot of people can agree with me on that. There's just not too many good jobs here. A lot of people have left the state for better opportunities. New Jersey "on the other hand" does have plenty of jobs, and the reason why everybody is leaving there is because it's too expensive to live. However, there are wealthy folks here in WV. For example, right here in Putnam County (the richest county in the state), they are building a lot of expensive houses along I-64. Also, there are poor people in NJ as well, but if they moved to WV, people here would consider them "rich". And if a wealthier person from WV moved to NJ, I'm sure most people there would consider those people "poor". So the bottom line is......I think most West Virginians have a higher quality of life, along with the rest of the South. You may not agree with this, but I found this site while searching Google. Just thought I would share it with everybody. "Nationally, 12.4 percent of residents are considered to be in poverty. �In Poverty� means that a given person falls below the poverty threshold assigned by the U.S. Census Bureau. Please see our chart topic on Poverty for a discussion of poverty thresholds. Examination of the map shows, however, that this 12.4 percent is a misleading representation of poverty status across the United States. Poverty is considerably more prevalent in the southern states. In a clear majority of counties in the South, the proportion of persons in poverty is higher than the national rate." Last edited by Colby "The Punk" Wells; 04-08-2008 at 12:49 AM.. I also found this while Googleing. I was intrigued with your maps and will give them a good look later...IMO the cultural fault line lies at Summers County. A distinct southern dialect is noticed in that area. I will say that it is warm, inclusive and shows the friendliness of the populace. We are diverse...is this an issue of any sort? We are the product of our heritage. We also have the power to choose to make changes. That power to choose defines us. Do we have the courage to be us and be comfortable about being us. To do that, we must know who we are...for some, who do not know who they are, its an unsettling situation.